At church on Sunday, our pastor was intent on encouraging the congregation to make Thanksgiving less trite and more meaningful. I got exactly what he was saying. Making a list of things for which we are thankful for is simple. Living a life that demonstrates our gratitude and shares our blessings is entirely different. 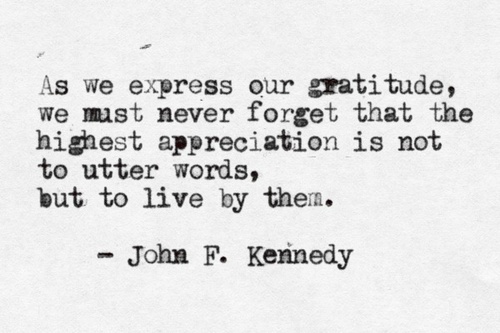 John F. Kennedy understood this, and his quote about gratitude being shown not by the words we utter but by the life we live always makes me smile. Posted on November 28, 2013, in Family, My life, perspective and tagged 365 reasons to smile, Family, gratitude, perspective, smiles, Thanksgiving, Thoughts. Bookmark the permalink. 44 Comments.